My new calendar "Sagenhafter Pfälzerwald 2019" is now available here! This page is about all the subjects related to photography that I am interested in. These include, above all, landscapes and nature photographs from the Wasgau region and the surrounding areas. Macro photographs are present as well, giving an insight into a world that can not be perceived in this form with the naked eye. During the day I am software a developer. In the year 2010, my first planned landscape shot was taken. Since then, I am fascinated by photography. In my free time, I often travel around the area to capture special moments. The light of the rising or setting sun, which makes the clouds glow red. Clear air after a long-lasting snowfall or the clouds of an approaching storm. All this, in combination with our beautiful landscape, creates unique situations that are difficult to plan and therefore make the recording of a photograph particularly challenging. In the wide landscapes are often very tiny details such as colorful butterflies or dragonflies. To make them visible is another discipline that has inspired me from the beginning. I am also working on creating timelapse recordings. The results are also presented on this page. 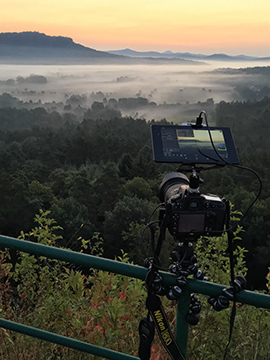 As a side product, software solutions are sometimes created by me to solve specific problems when dealing with special light situations or creating timelapse movies. As soon as something is published, you can also find it on this page. And now I wish you a lot of fun! If you have any questions, please contact me at info@stefan-engel.photography.